In Florida, whether or not you take your case to trial or if you settle your claim through an insurance defense lawyer or with an insurance company, there are certain kinds of losses for which you will be compensated and some losses for which you will not be compensated. Only those losses recognized as “damages” under Florida law will be covered by either a settlement or a jury award. The wrongdoer, no matter how badly they have neglected things and caused your accident which resulted in your injuries, is not responsible for paying you, as the claimant, for anything that is not legally recognized as an area of damage under the law. Compensatory damages do not always fully compensate in grievous situations nor do they have a general salutary effect under prevailing conditions to promote fair treatment of the public. At best, litigation, even when successful is an inconvenience, often an ordeal. Compensatory damages do not sometimes offer reparation for mental invasion. Moreover, it is difficult to translate pain and suffering, disfiguration, loss of enjoyment of life, loss of prospects, into compensatory dollars. 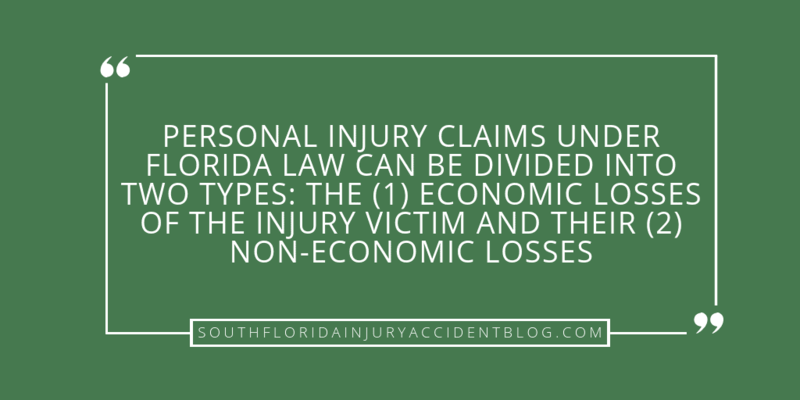 Personal injury claims under Florida law can be divided into two types: the (1) economic losses of the injury victim and their (2) non-economic losses. If these losses are recognized as legal damages then Florida personal injury law can be used to have the person or company responsible for the accident and injury pay for them. If the losses are not recognized under Florida law, then they don’t have to cover them as legal damages in a negligence claim. While it’s is not that easy to quantify pain that someone feels, and it’s true that some may be more pain tolerant than others, it is possible to prove some level of pain and suffering through things like how often the injured person needs painkillers; how much treatment and therapy is needed; and the expected recovery time predicted by the physicians and therapists. The complaint in the case alleges that Mrs. Champion heard the accident, came immediately to the accident scene, and suffered severe emotional distress and shock which led to her death shortly after seeing her injured child. The requirements set out in this opinion have been met. No physical impact to her need be alleged because she suffered discernible physical injuries (death). Accordingly, we answer the certified question, as limited, in the affirmative. We hold that a claim exists for damages flowing from a significant discernible physical injury when such injury is caused by psychic trauma resulting from negligent injury imposed on another who, because of his relationship to the injured party and his involvement in the event causing that injury, is foreseeably injured.